I’m sorry about not getting a post up on Monday. Well, not really. I was out of town meeting my nephew. Today, I’m going to talk about something a little different. I’m going to talk about taking time out to NOT write. Don’t get me wrong. You still need to write. But, it’s okay to take a break. Really, it is. On my Facebook page, someone posted on my timeline saying that meeting my nephew and watching my sister’s two other kids is no reason to not write. I’m sorry. What? What do you mean it’s no excuse to not write? I get that my story is my child. Really, I do. But that’s a child that doesn’t have to be fed and can be set aside for a few days (I’m a horrible mother. I know.). Just because you work hard on your book and you really want to get it out there doesn’t mean that it’s not okay to take a break. I haven’t been able to do a lot of writing this week because I’ve been so busy with school and work and then going out of town on Sunday. And then, on top of that, I managed to leave my laptop at my sister’s house. Here we go again with the no laptop thing. Oh, joy. Oh, yeah. It’s okay to take a break despite what you believe. It really is. Are you out of town? It’s okay to not write. Did you just have a child? It’s okay to not write. Think about it. I WAS going to try and publish Days of the Kill July 8. Then, I realized that I was going to be out of town for a couple weeks at that point. So, I put it off until November. I wasn’t going to bend over backwards while on vacation to get my first book out. Instead, I’m going to be doing that during NaNoWriMo. It’ll be time to get way ahead at that point. 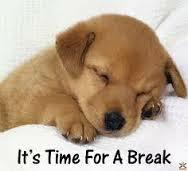 So, my point is, it’s okay to take a break. Your writer anxiety will thank you for it. I agree with you completely. Taking breaks to recharge your creative batteries is important, and sometimes it is the best thing you can do for your writing!